What would you think if I told you to read Paper Valentine without reading synopsis? I bet you’d think romance immediately. That’s what I thought, because of the pretty US cover and cute title, I went for it. Now imagine my surprise when it showed up on my doorstep as the Australian cover with this paper love heart, decorated with blood? I practically went all freakish as I always try to avoid ghost stories. Even though I seem to be reading all the ones being published this year. 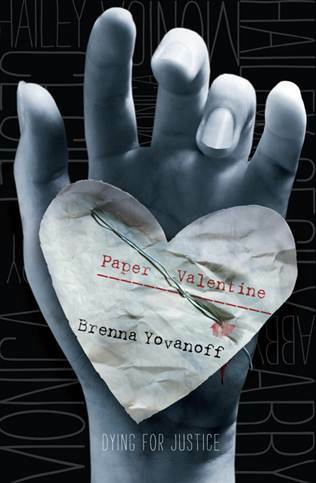 Paper Valentine is a mixture of three main components: Contemporary, romance and most importantly, mystery thriller. Each of these aspects fit perfectly with each other, it’s so obvious of how well Brenna Yovanoff can write. Even though the beginning wasn’t exactly the best, as I read this dark and creepy book, Paper Valentine grew onto me. Expect this book to stun you with twists, cute romance and overall, a quite mysterious killer. Hannah has been seeing her best friend after six months of her death- as a ghost. But that’s the least of her worries, as there’s a killer on the loose, murdering girls in Hannah’s suburban area, leaving children’s toys and paper valentine hearts on the dead corpses. As Hannah attempts to seek out the Valentine Killer, she becomes closer to danger herself. For me, Hannah was hard character to analyse and categorise. But one thing is for sure, this girl has depth. I just re-wrote this part 3 times After some thought, I have come to a somewhat relevant conclusion. Hannah sets the mood of this book. If she’s depressed, I was set in a melancholic subtleness, then when I reached the creepy scenes of tense mystery I was almost immediately dragged into this phase where you just want to look behind your shoulder and jump at every freak in the floor. Brenna Yovanoff created Hannah’s personality so intricately genuine that it takes ages of thought about exactly WHAT type of person Hannah is, with the fat layers of emotions being played with, I still can conclude that Hannah was a loveable and appreciated character by me. So like I was saying, Hannah was relatively a quite character throughout even though she manages to keep a cogent voice throughout the novel. But the siding characters she conscientiously mingled with, the connections were stable and unforgettable. My cherished bond had to be Hannah and her little sister’s one. The way her little sister wanted to be protective of Hannah was not only cute but also ringed the tightness in this hopeful family and the same genes of Hannah, except her sister was more outspoken. Another admirable connection was the romance. While I wasn’t too happy about the amount supplied, Paper Valentine does justice with a bad boy. Finny; misunderstood, rebel, deep and willing to fight anyone in his way, mysterious, suspected murder even. All if those word(s) are it exactly sufficient to describe Finny perfectly. He is a bad boy, but really soft hearted inside. Nonetheless, he was the perfect match for Hannah- even though I thought it was an absurd match at the beginning, Brenna manages to satisfy with her secret ways. One major thing that bugged the crabs out of me in Paper Valentine was the background information and loose strings at the end. I wanted to know more about Lillian as a person when she was alive, while there were flash backs and referrals, I wanted Lillian herself to open up so I could explore more of her. Same for Finny. Okay, so maybe he’s a mysterious guy that doesn’t really reveal much about his past, especially because he was the love interest, I wanted to get to know him more. Moreover, why can Hannah see ghosts? Why can she talk to Lillian? Maybe if there was a sequel, these issues wouldn’t have bothered me, but quite frankly and sadly, there is no sequel. All in all, Paper Valentine was a capturing sinister yet quiet read. For my first Brenna Yovanoff novel, I must admit that I’m off on a great start and will be eagerly awaiting more of her books. While the prose took some time to adjust to, this book filled me with chills. I recommend this book to people who enjoyed The Dead and Buried, Pretty Girl-13 and other mystery thrillers out there! Yay thanks Lia! Hannah was most def. a different protagonist compared to others. You and I had a similar reaction to this! I liked it overall, and I agree about Hannah, though I also wanted to get more information. I felt like there were too many unanswered questions for me to be completely satisfied. Still, it was my first Yovanoff book and I’d still happily read more from her. I’ve always been fond of Aussie covers/ UK covers. This one is a great example, especially how it isn’t misleading. Same! They just always seem to end up in my hand :O Shame you didn’t like whatever book you first read by her, but I’m sure this one will be better! Paper Valentine sounds super interesting! The romance also sounds great. I don’t usually read creepy books, but I may have to give this a try 🙂 Amazing review! Thanks luv! Creepy books are always the ones I try to clear away from but it’s still quite tempting! They sure are, I hope you love them! I just saw your comment about the UK/Aussie covers and I have to agree! I’m from the UK and, I may be bias, but I always prefer our covers to the US ones. Awww this is such a cute blog! And I love your rater and how perfect it is. Anyway, the review. I liked this one a lot. I totally agree that Hannah was such an important character in the story she gave me the creeps. How the MC would walk into a room and she would just be perched on a shelf all creepy like, it really set the tone of the story. Fabulous review! I heard about this book earlier today on another blog, and I was instantly attracted to it by the summary and the cover. It sounds like one super amazing read! I like how long your review is, I appreciate a review with a lot of thought in it. Sorry to hear it was missing some things, but at least you enjoyed it!